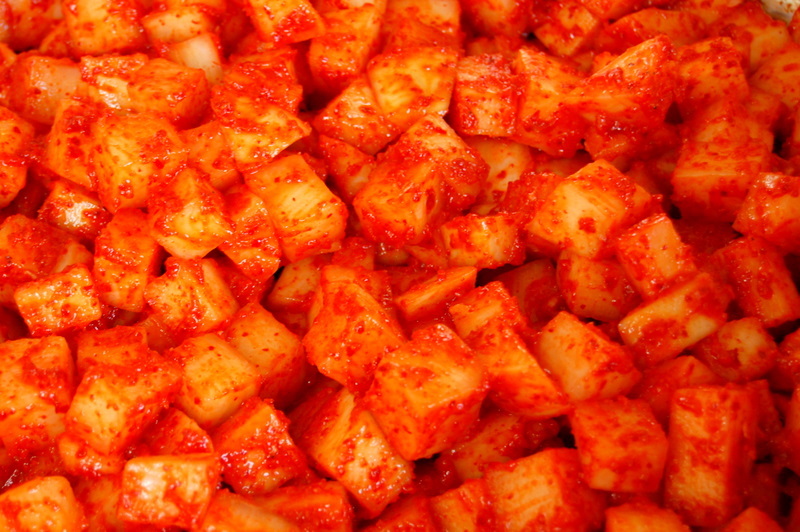 Can you think of a better way to start off the new year than with a huge batch of delicious, spicy cubed radish kimchi (kkakdugi)? 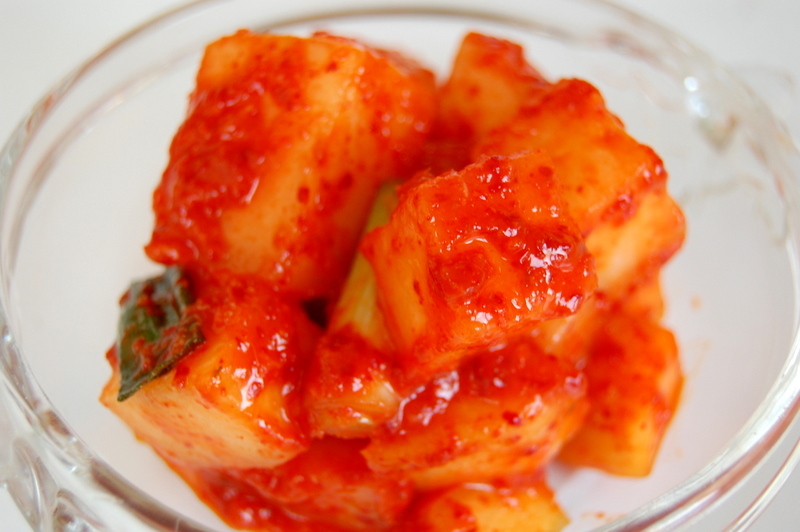 Now that I have the green light to reintroduce spicy foods back into my post-cleanse diet, I am so excited to share this delicious kimchi recipe with you. 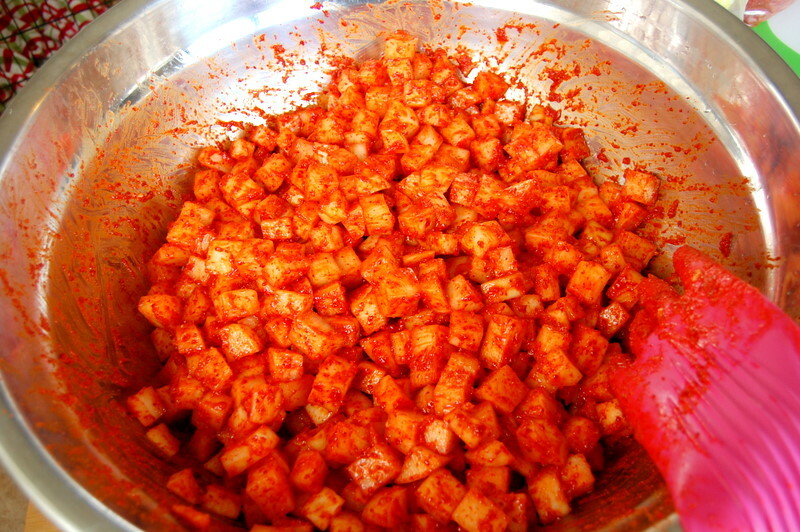 For me, this is easier to make than regular kimchi, as the marinade/sauce is super-simple and the process is much less time-consuming. And did I mention that it is outrageously tasty? 1. 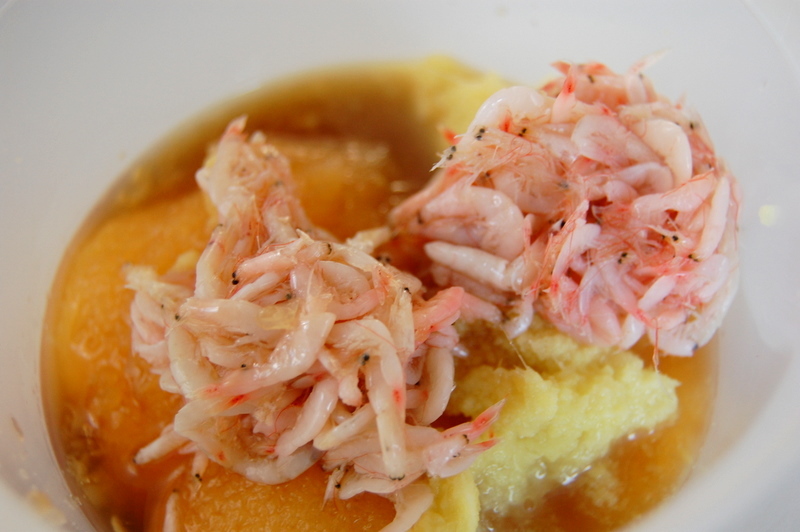 Please don’t be frightened to use salted shrimp, they’re really quite delicious and I call them Asian Anchovies. And, they will practically dissolve in the liquid the kkakdugi will give off during the fermentation process, so no need to fear! 2. Try to use sweet rice flour, I recommend Mochiko. Of course, I didn’t have any at home so I ground up some rinsed and dried sweet rice into a powder and it worked just fine. 3. 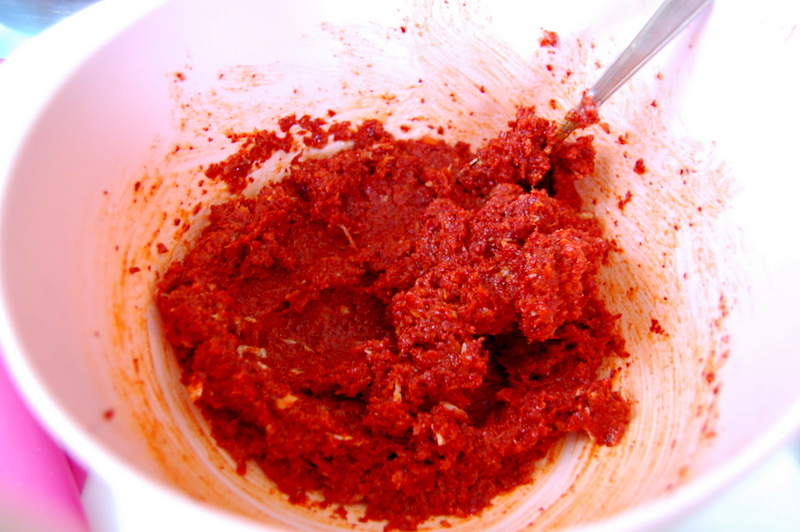 If your spice-tolerance is not quite Cozybogie-level, feel free to use 1 cup of red chili powder. 4. 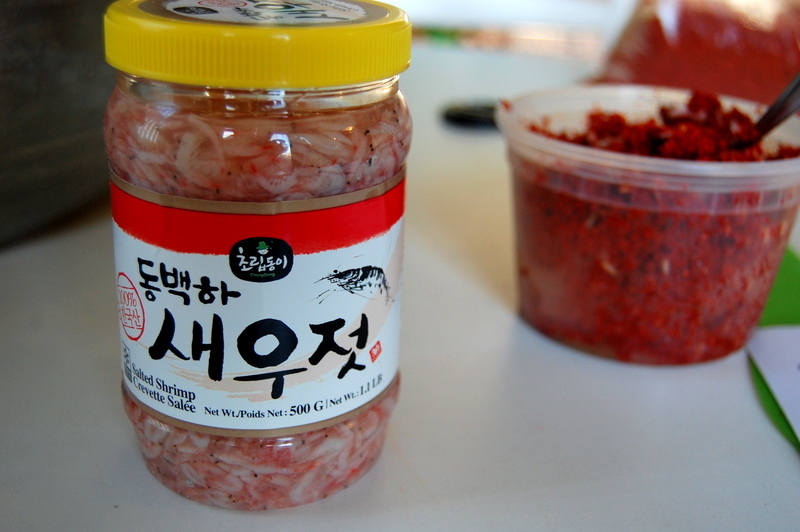 This tastes especially amazing with a hearty-meaty soup, like my ox-tail gori gom-tang. 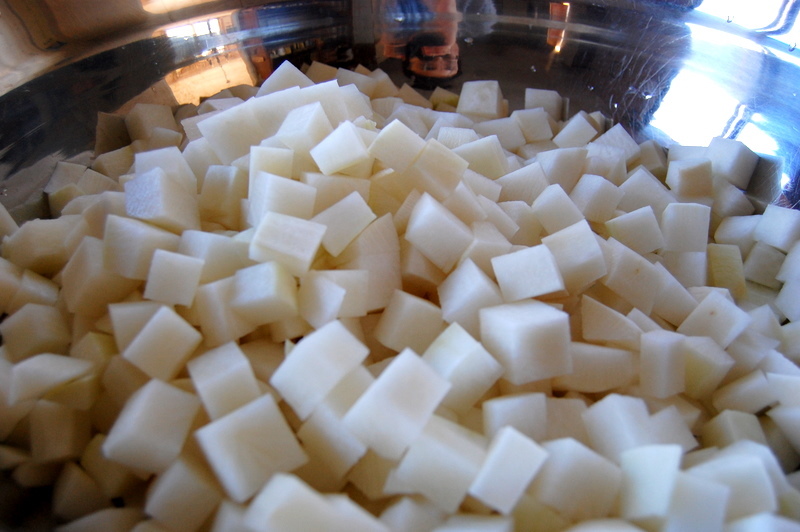 Clean, peel and dice your radish into cubes. I like my radish cubes to be on the smaller side (around 1.5 times bigger than a game-dice) but feel free to cube them however you’d like (but I would keep them MAX 1.5 inch cubes). In a HUGE metal bowl, sprinkle 1/2 cup of the coarse sea salt and using kitchen gloves, mix well so that all of the radish are coated evenly with the salt. Marinate for 30 minutes. While the radish is being salted, assemble your marinade ingredients. 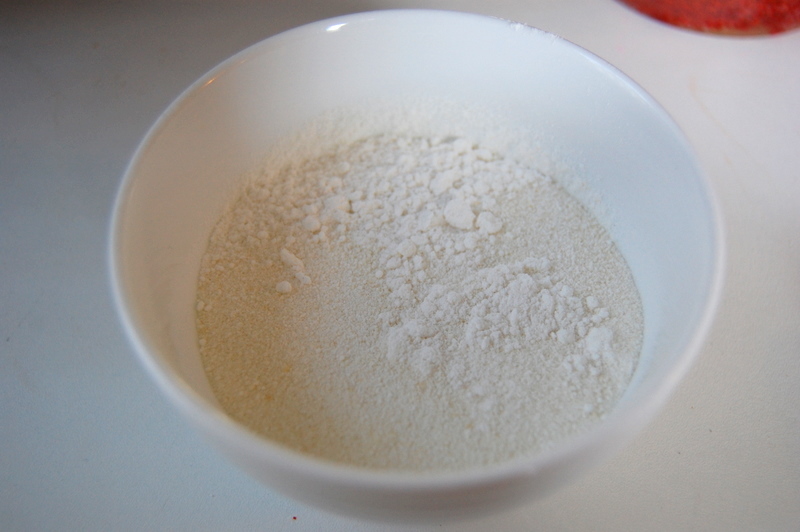 First, mix the sweet rice flour with the water and microwave it for around one minute, and then stirring well to mix, and microwaving it for an additional 20 seconds. You should have a nice paste. Set aside and cool completely. 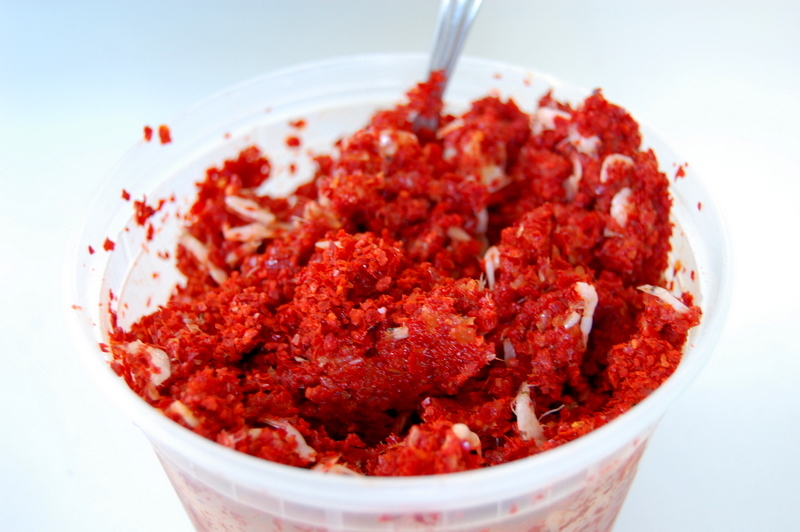 In another bowl, assemble the rest of your marinade – garlic, ginger, fish sauce, salted shrimp, sugar, and gochukaru. 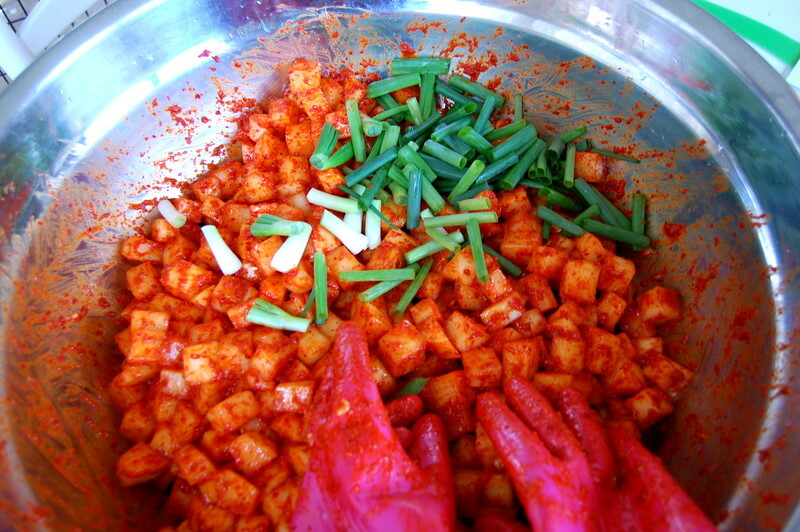 Mix gently, and then when the sweet rice paste is cooled, mix all of the ingredients together until it forms a nice paste. Carefully drain the radish from the liquid it has given off, and rinse half of the radish with water and drain. Add it back to the bowl with all of the radish (there should be no liquid) and add the sauce. 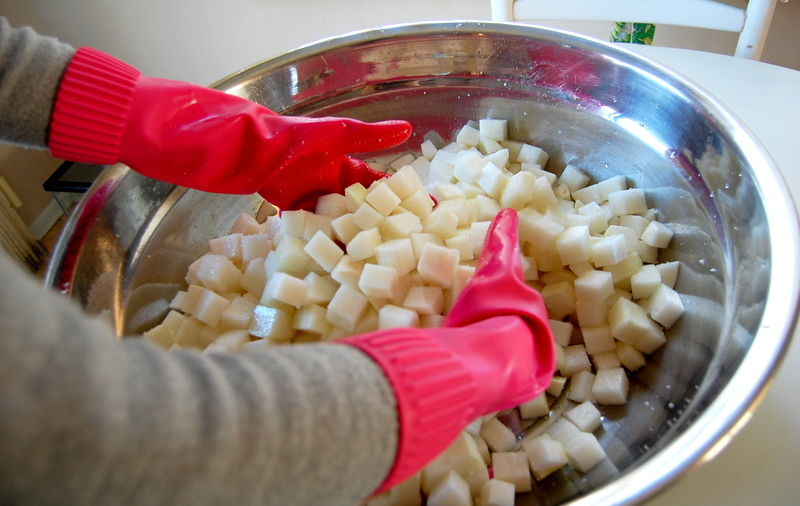 Using the kitchen gloves, carefully mix all of the radish so that every piece is coated generously with the sauce. 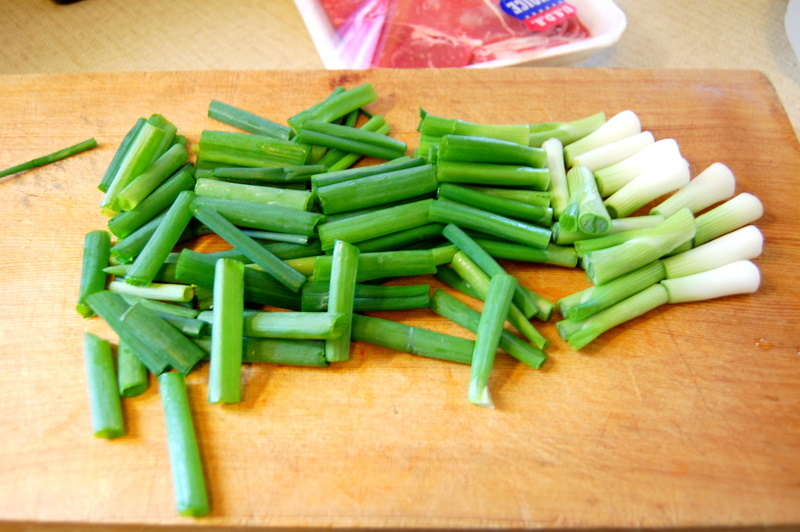 Add the green onion and toss a few more times, and then transfer the mixture into air-tight containers. 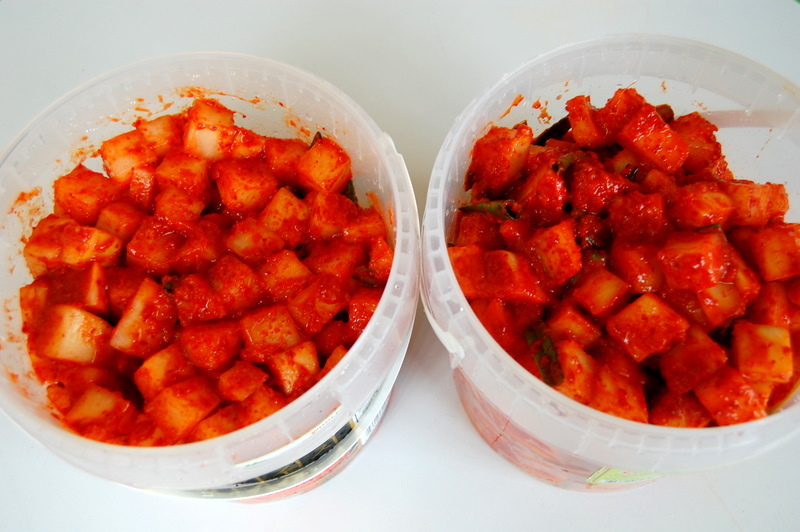 If you want your kkakdugi to last longer, refrigerate immediately and taste in 6-7 days, if you can’t wait to eat it, leave it out in room-temperature for 1-2 days and then refrigerate and try it 2 days after. 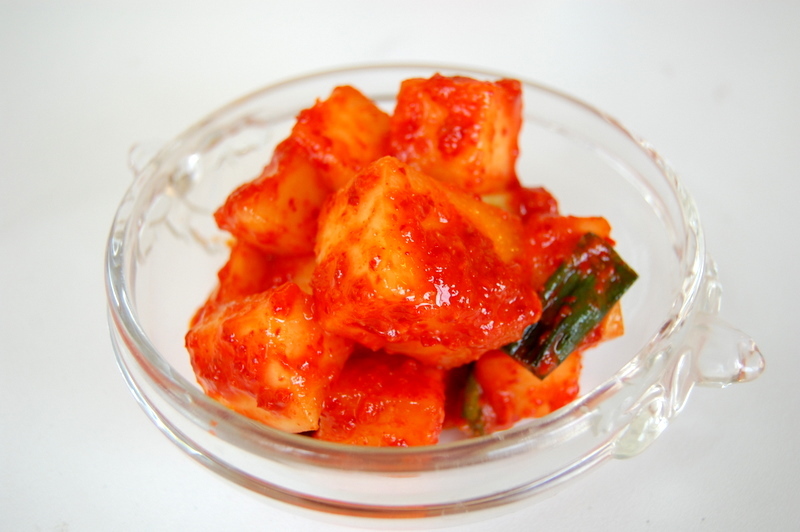 It will take a couple weeks for the flavor to fully-develop, but if you are like me and can’t wait, waiting one week is fine for some fresher-tasting kkakdugi! 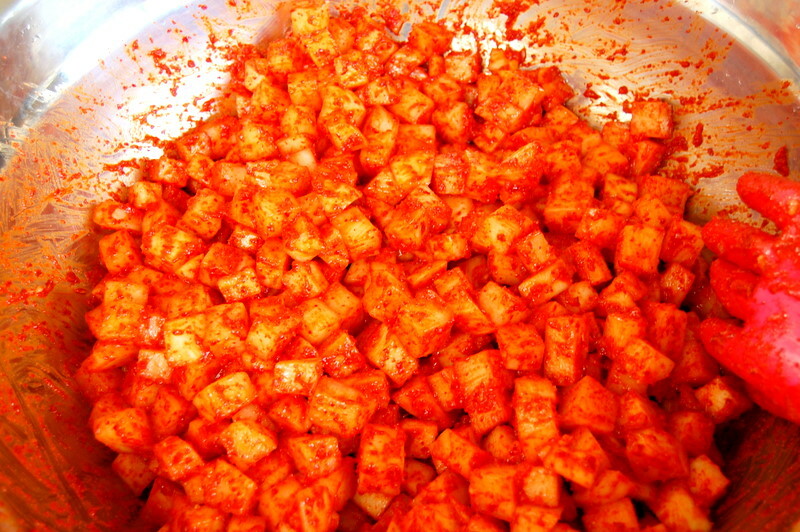 Dongchimi is one of the easiest types of kimchi to make, and most delicious. Traditionally, it is often enjoyed during the winter, but I think due to its refreshing and ice-cold nature, it can be enjoyed all year round. 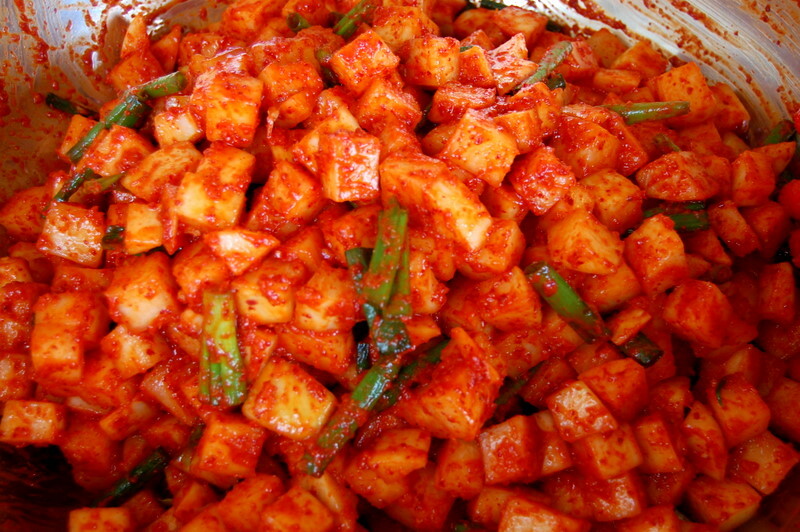 It is a non-spicy variety of kimchi well-suited for people who like anything pickled, vinegary, and tasty! And this one happens to be vegan. 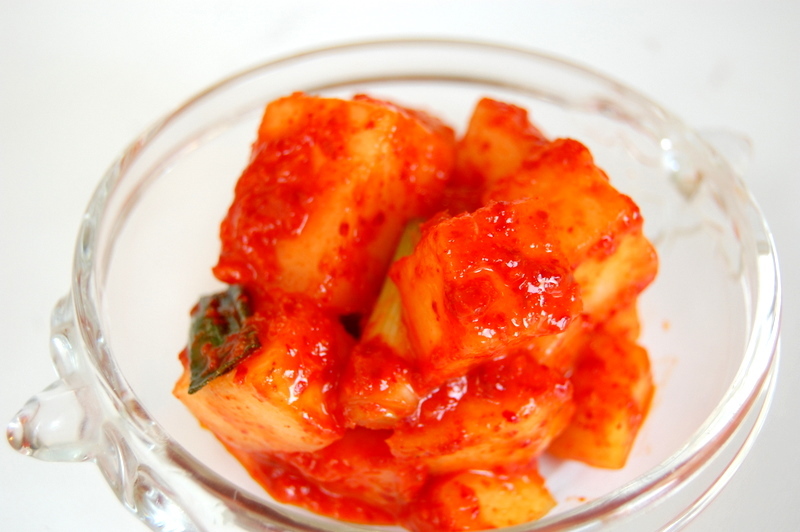 Dongchimi kimchi is traditionally served in large wedges that are cut into smaller pieces when serving, but I am a glutton for simplicity. 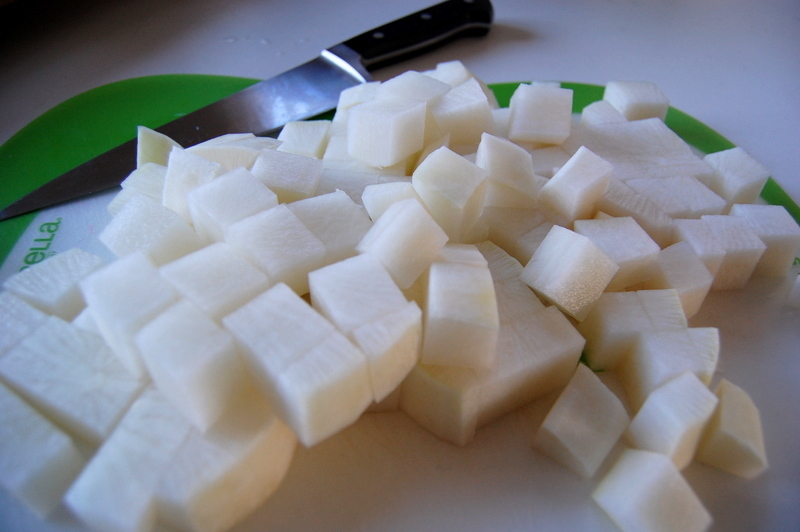 So, I cut my radish into slices or little fat french-fry pieces. For this post, I decided to cut them into the french-fry shape, but you can also leave them as 1/2 inch slices (as the recipe states). 1. Prepare your radish. 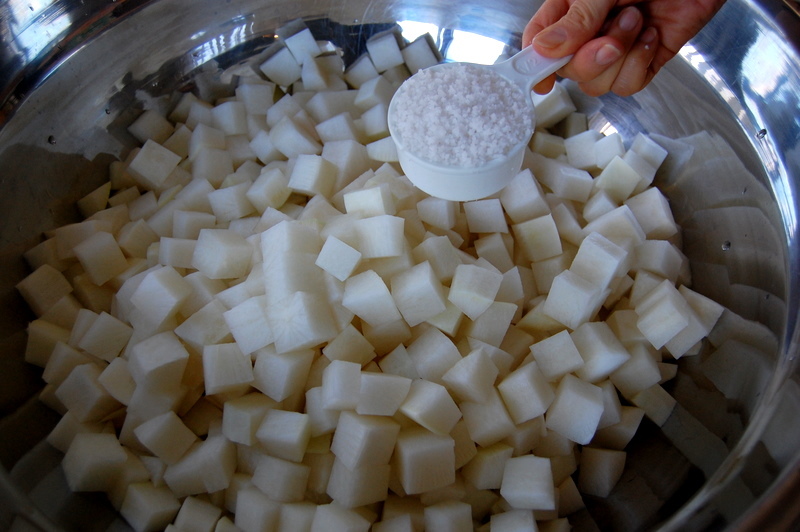 After you’ve completed slicing, put the pieces into a large bowl and sprinkle 1/2 cup of coarse sea salt over them. Mix thoroughly with your hands, making sure all the radish are coated with a layer of salt, and then let it stand for one hour. 2. 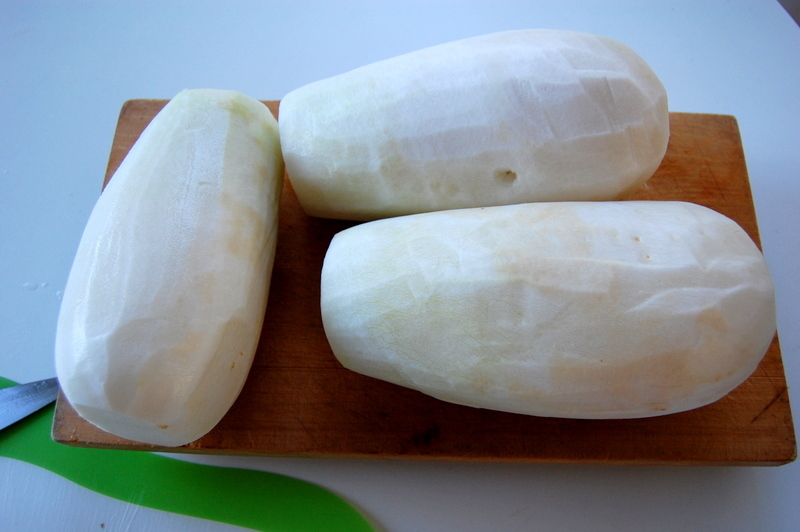 While the radish is marinating, prepare the rest of your vegetables, garlic, pear and ginger. 3. 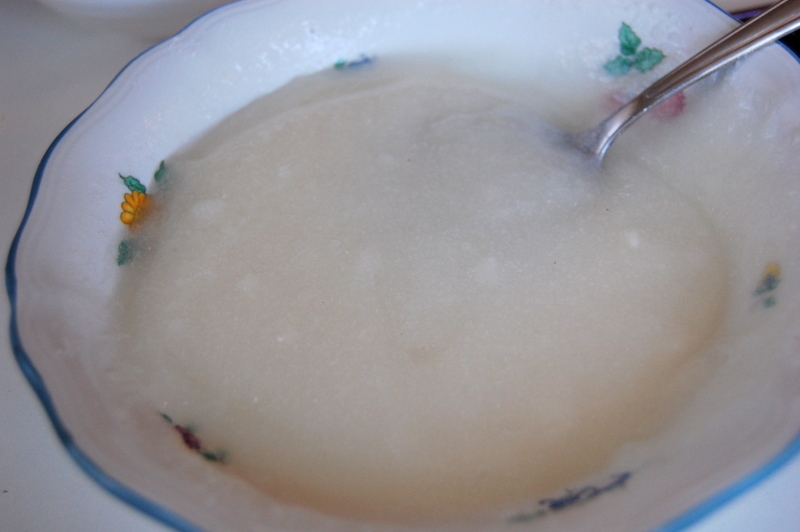 After one hour, the radish will have accumulated about a cup and a half of salt water mixture. Drain the radish and reserve the salty liquid to taste later on. 4. 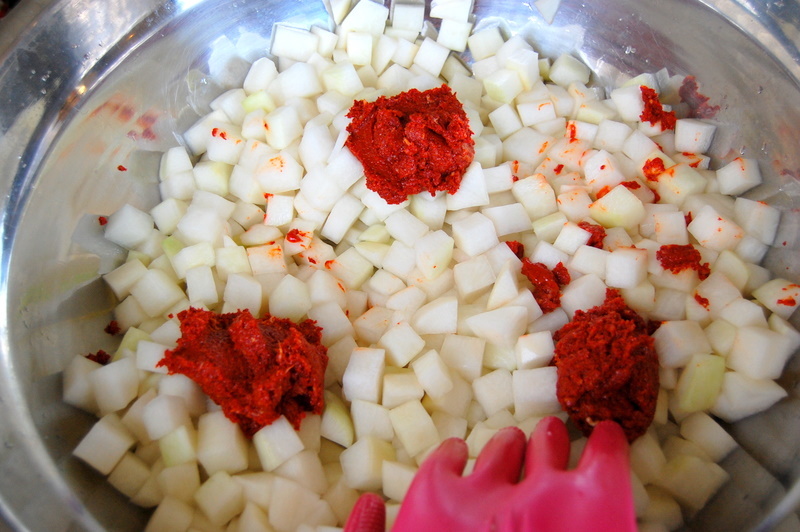 Combine the radish and the rest of the vegetables, garlic, pear, and ginger into the large pot or bowl. 5. 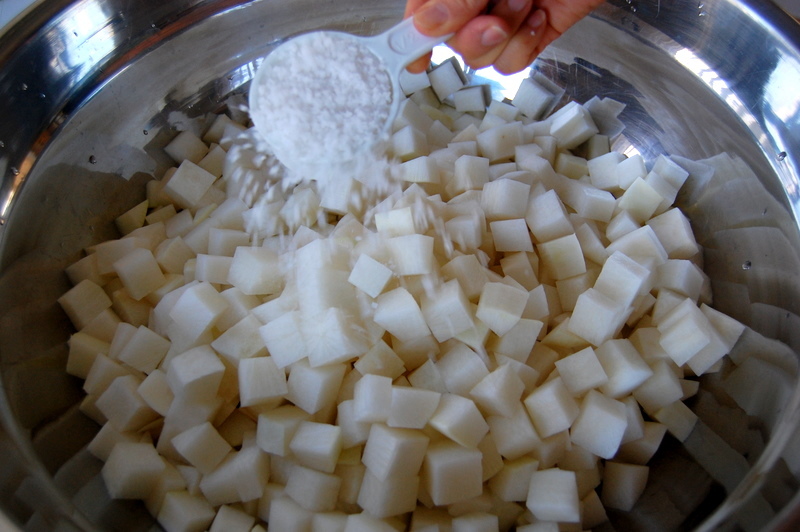 Mix the sugar with a quart of the water so that it dissolves completely, and then add that to the pot with the radish and vegetables. Then add the rest of the water and stir gently. Taste, and add the salt liquid reserved from the radish according to your taste. I generally use around a cup of the salt liquid mixture back into the pot. I hope you enjoy this! 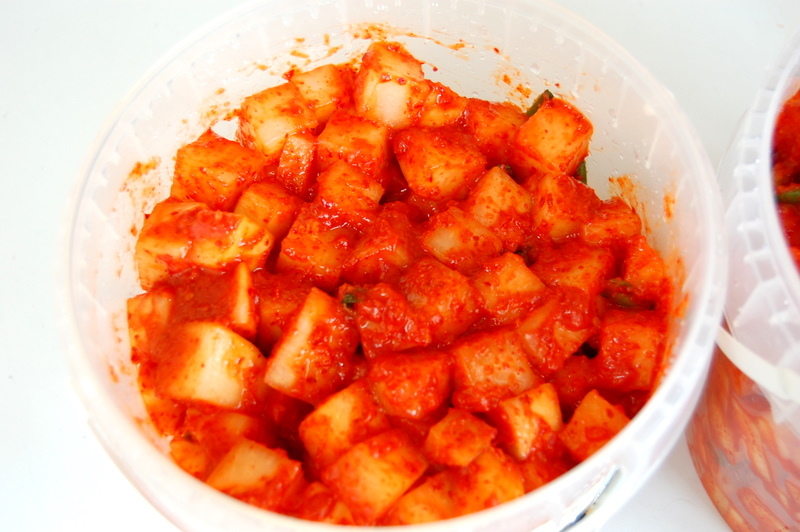 I like my kimchi really fresh and not too-fermented, so this was perfect for me about 3-4 days after I made it. It’s all according to taste, so try a little bit every day and see what you like the best. You are currently browsing entries tagged with korean at Career: Housewife.